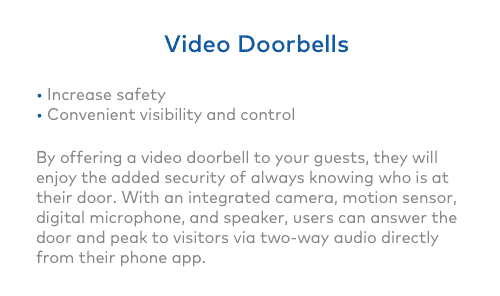 See how we help save energy, provide keyless access and help guests enjoy every moment of their stay in short-term rental homes, condos and timeshares. Whether you manage 5 or 50,000 homes, our system can provide services such as unattended showings, secure access and HVAC control in vacant properties and continue to provide value to residents during occupancy. Garden style or high-rise, we help multi-family property managers better manage individual unit and common area access for residents, work orders and property turns, while giving asset managers a differentiated and value-added amenity that residents want. That enable property managers to improve their operations and enhance the appeal of the properties that they manage. Know who accesses the property, when and for how long. Eliminate the burden, risk and lost time associated with mechanical keys and take control of your business operations from anywhere – even on mobile devices. 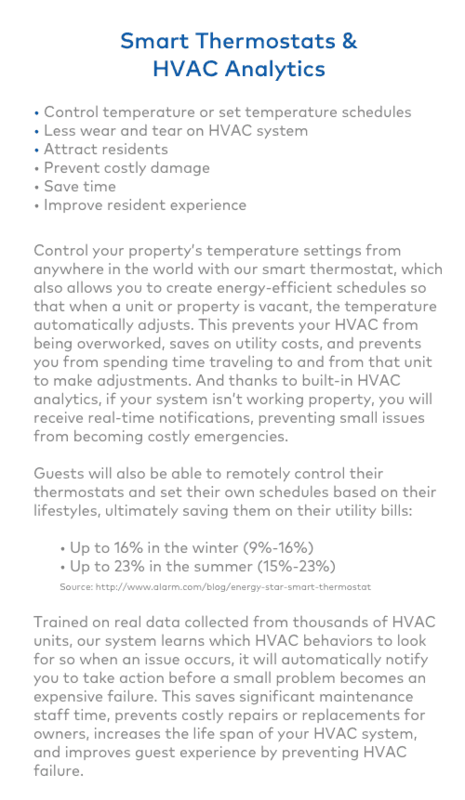 Control your energy consumption across ALL of your locations. Keep unoccupied properties comfortable and dry by setting min/max thresholds for temperature and humidity. Keep an eye out for leaks and receive notifications, or shut off the main valve, if you detect a problem. Tenants want and will pay for home automation. Tenant-friendly access via apps, websites and voice assistants. 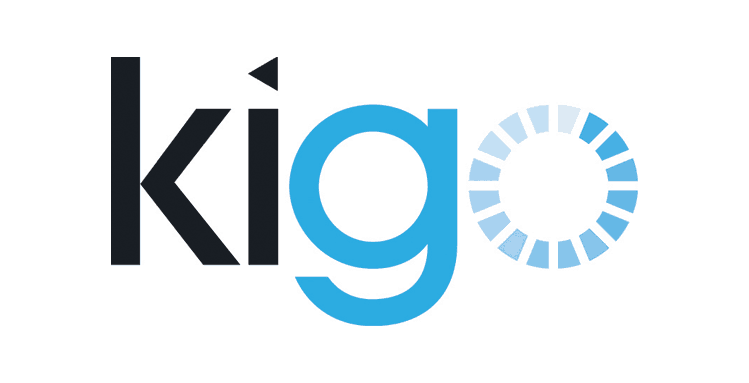 Learn more about why the vast majority of property managers and owners use our enterprise-scale technology. Our software is not a DIY product trying to mask itself as a business tool but specifically built with the needs of short and long-term property managers in mind. 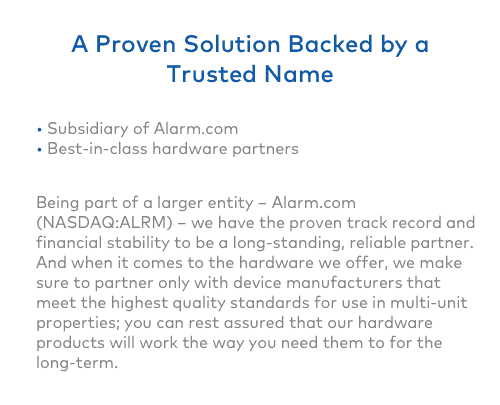 Being part of a public entity, Alarm.com (NASDAQ:ALRM), we have the financial stability to be a long-term partner. 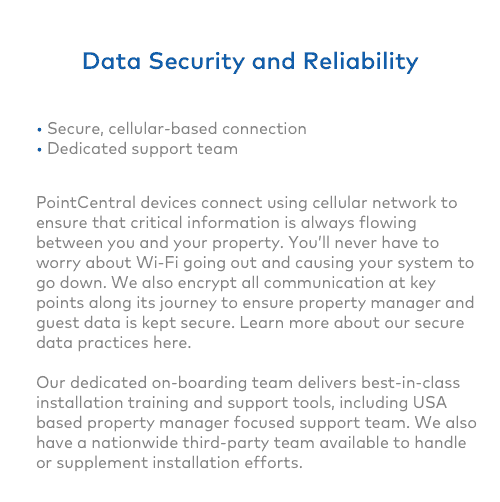 We use private cellular lines to ensure that critical information flows between you and the property. We encrypt communication at key points along its journey, to ensure property manager and tenant data is kept secure. 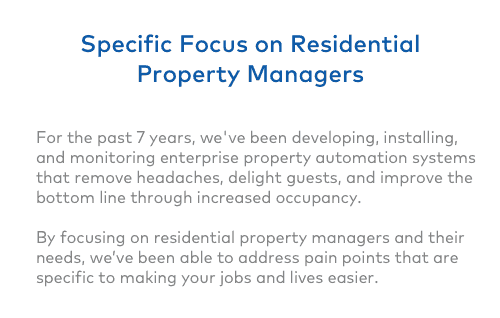 With over 5m properties on our collective platform, we have the scale to truly analyze data and deploy insightful results that property managers value. Our team has the experience and capabilities to serve as a trusted advisor in helping to understand the best use of our solution for each property manager’s needs. We have been able to detect and resolve all HVAC issues prior to the summer season beginning. This has prevented us from having to relocate guests which, that alone, has saved us a significant amount of money. It allows our guests to have a comfortable stay without any interruptions. 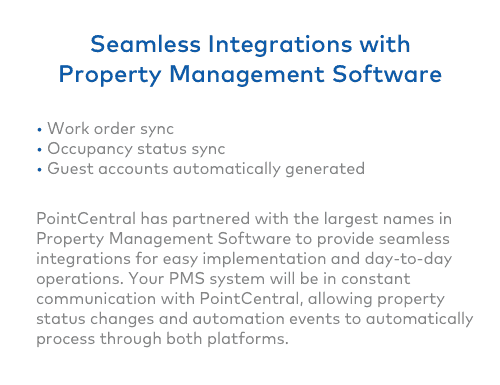 We are very happy with Point Central and all of its components. 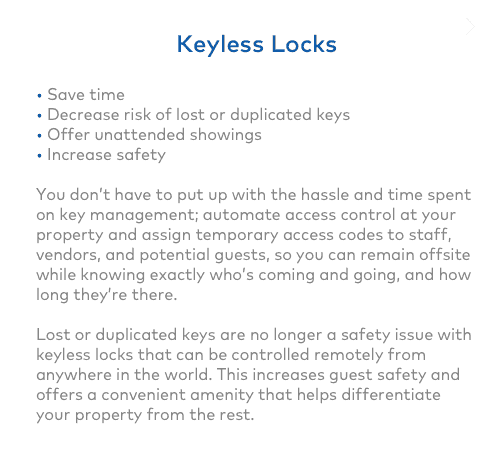 Our guests love the ease of check-in and check-out and our property owners love the increased security and elimination of keys. 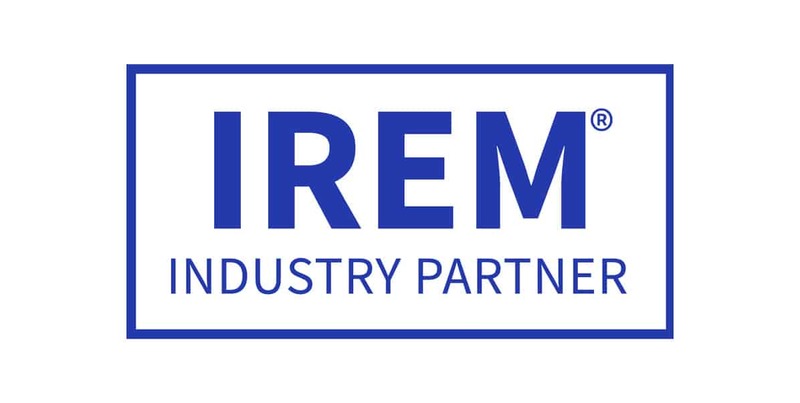 helping us to drive efficiencies and process improvements within our own business. We are using PointCentral locks to sign up new owners. I have been told that we were the company of choice and the locks and technology had a big part to play in their decision. Our team is ready to respond to your inquiry as quickly as possible.